The grouping’s assertion on dialogue and reconciliation, emphasis on the role of the UN, and opposition to sanctions have not only increased its visibility and role in international arena, but also have elevated it as a global player. The foreign ministers of the BRICS reiterated during their meeting on the sidelines of the Nuclear Security Summit at The Hague their position against sanctions as viable means to resolve conflict over Ukraine. More importantly, as members of the global economic body G20, they opposed any idea to ban Russia from taking part in the forthcoming summit. They argued the decision about the multilateral body cannot be taken unilaterally. BRICS can play the role of a bridge-builder between Russia and the West. 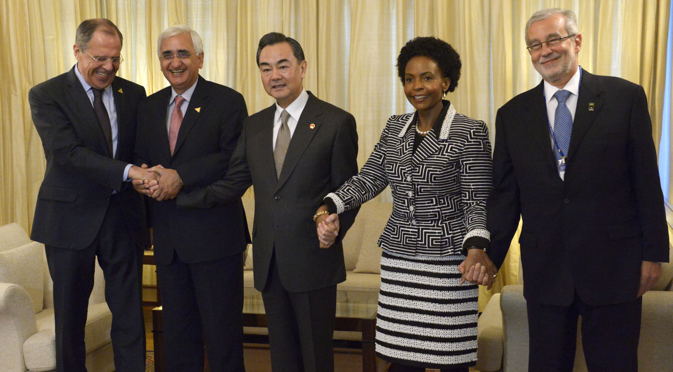 Brazil, India, China and South Africa, along with Russia, have reiterated their common position how to defuse the crisis. The joint statement of the group at The Hague is a clear reflection of this. Sanctions will back fire, so also force. The US President Barack Obama has admitted that sanctions will have “disruptive effect” on the global economy. The intensification of sanctions and counter sanctions may impact the economic situation of Russia, but that will not leave the West, including Europe, untouched by the repercussions. Europe is heavily dependent on Russian energy. Even the Ukrainian economic situation will deteriorate with sanctions, with the country being heavily dependent on the Russian market and energy resources. One important factor that needs emphasis is the role of BRICS in the crisis. BRICS is relatively a recent phenomenon. It was not in the scene during the Cold War. It would perhaps be a fruitful exercise in retrospect to weigh the impact of BRICS or a like group on Cold War era politics. The grouping’s assertion on dialogue and reconciliation, emphasis on the role of the United Nations, and opposition to sanctions have not only increased its visibility and role in international arena, but also have elevated it as a global player. The foreign ministers of the grouping in their joint statement argued, “The escalation of hostile language, sanctions and counter-sanctions, and force does not contribute to a sustainable and peaceful solution, according to international law, including the principles and purposes of the United Nations Charter.” To Australia’s foreign minister’s proposed idea to ban Russia from the November meeting of G20 at Brisbane, the ministers stated, “The ministers noted with concern the recent media statement on the forthcoming G20 summit to be held in Brisbane in November 2014. The custodianship of the G20 belongs to all member-states equally and no one member-state can unilaterally determine its nature and character.” The BRICS members played crucial roles in the formation of the G20 and its functioning and laying out its agendas. During its meeting at St Petersburg in Russia last Septembers the group members pledged “continued commitment to work together to strengthen the global economy”. The recent developments amidst the crisis are not that negative. The Russian foreign minister met the Ukrainian interim foreign minister at The Hague. The meeting, first one among the top officials after the crisis erupted, was hailed in many quarters as a positive step towards deescalating the crisis. As per a report, Lavrov outlined the steps the new Ukrainian government needs to make to defuse the crisis. The Russian minister also met his US counterpart. President Putin’s scheduled visits to Germany in April and France in May are still on the card. The situation in Ukraine and the emerging stand-off have reminiscence of the Cold War when the East-West confrontation was an oft-repeated syllable in international politics. One of the veteran diplomats of that period, Henry Kissinger, in a recent op-ed argued that any such degradation will be profitable to neither of the parties. The Ukrainian crisis needs to be viewed from a “calm and level-headed manner” (to use the phrase from the joint statement of the BRICS ministers), while keeping in view interests of all parties involved. Russia’s interests in its immediate neighbourhood including Ukraine are not only geopolitical but also historical and cultural. Kissinger argued that for Russia, “Ukraine can never be just a foreign country. Russian history began in what was called Kievan-Rus. The Russian religion spread from there. Ukraine has been part of Russia for centuries, and their histories were intertwined before then”. The parties involved in the conflict need to take into account these dynamics. And at the same time, there is a need to address the conflict from non-violent and peace perspective. BRICS can be a balancer of values between the East and the West. It can also be an enforcer of dialogue and deliberation, while at the same time playing a role to offset policies that aim to destabilize the global order. The idea to ban Russia from the G20 would further contribute to conflict, instead of resolving it. It needs mention that the G20, with emerging as well as developed economies as members, has proved more representative and effective in addressing global economic issues. With all BRICS countries being members of the G20, the grouping, which has a balanced approach and policies, is better poised to play a larger role in the conflict resolution process.